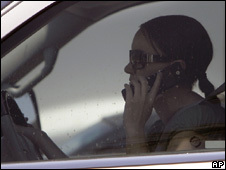 Police across Scotland have launched a one-day crackdown on motorists driving while using hand-held mobile phones. Officers were reminding drivers they face a £60 fine and three penalty points on their licence if caught. Courts can also consider discretionary disqualification and a maximum fine of £1,000 or £2,500 for drivers of buses, coaches and goods vehicles. The country's eight police forces were taking part in the 24-hour Mobile Phone Day of Action, which began at 0700 BST. The exercise is designed to remind motorists of the risks of driving while using a mobile phone and is being co-ordinated by the Association of Chief Police Officers in Scotland (Acpos). Acpos research shows that drivers using hand-held mobile phones while driving are four times more likely to be involved in a road crash. Chief Supt Mike McCormick, from Acpos, said: "You can be stopped by police even if you are using a hands-free phone if your driving performance is impaired by using a mobile phone in any way that creates an accident risk, and you will be stopped. "Or you could end up dead or killing innocent people, as has happened in England last year. "And under new UK road traffic safety laws, you will go to prison if someone is killed. "Don't do mobile when you are mobile, the consequences can be very severe, so don't risk it."